Surface mount ICs on adapters? Solder that was dripped on from up high and heated with a blow torch? Hahahaha. I promise i will make a better one. Just build this power supply. Works Ok but will blow output transistor instantly if output is shorted ! The original defective circuit had many overloaded parts that will blow up. The improved version fixes it. Opamp U3 senses the output current in R7 and reduces the output voltage and output current to match the current set with P2. The maximum output current is 3.0A in the improved circuit and the two output transistors have a total maximum current rating of 30A so they will not blow up with only 3.0A. I followed the discussions on the topic of the power supply project and during the last few years I set up different boards, all with the suggestions and improvements that you have suggested. In all the tests and prototypes that I made happens a small drop in voltage every time a load is turned on. This voltage drop goes from 0.02V up to 0.08V at the most different voltage and current. That is, at lighter loads it is at 0.02V, but at heavier loads it can reach at 0.08V. Is it possible to correct this little problem? What do you think about it? Thank you for your attention and I sincerely apologize for my English because I am from Brazil and I am using Google translator. Simply test voltages in the circuit with a voltmeter. The opamp U2 controls output voltage regulation and it has an extremely high internal voltage gain (220 thousand times for a TLE2141). The negative feedback of the circuit detects any output voltage loss and directs U2 to correct it. I think your poor voltage regulation is caused by the wiring from the output of the circuit to your load is too thin and causes the voltage loss. 1- A huge transformer with two 28v secondarys. One secondary has a low current for only driving the current and power regulation. Another secondary will deliver the high current and has multiples taps. Both have their own rectifier boards. 2- A voltage comparator will take care of the tap selection based on the output voltage of the power supply. A way to reduce power dissipation. I'm thinking about the lm339 or three lm311 and relays. I already made the transformer and i'm following the guide of a Youtube user who made the same modifications on the tl081 version of this power supply. This is basically how he explained the concept. 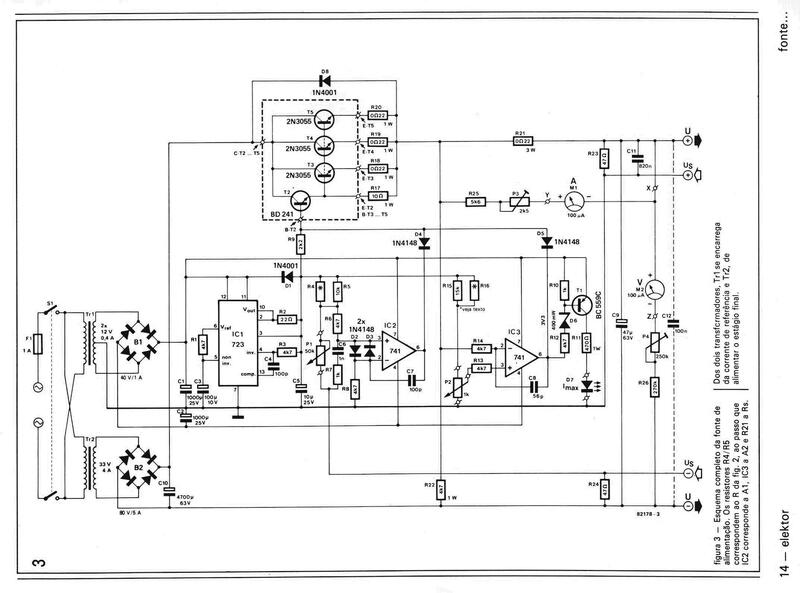 This approach is similar to the elektor power supply but without the tap selection circuit. Each comparator in an LM339 has an output current of only 4mA. Relay coils need more current so transistors or Fets must be in between. Your block diagram is missing the huge filter capacitor needed that might burn out the relay contacts when the relays switch taps. Your block diagram is missing the huge filter capacitor needed that might burn out the relay contacts w﻿hen the relays switch taps. I was thinking about the tap selection circuit being done before the rectifier diodes and filter capacitors. This image relates to a similar aproach using the lm338. Since the mc34071 needs a stable 40v supply and -1,4v. Another 28vac 600ma transformer is used for powering the opamps and generating the negative supply. Most of my concerns are about the right way to connect the second transformer. 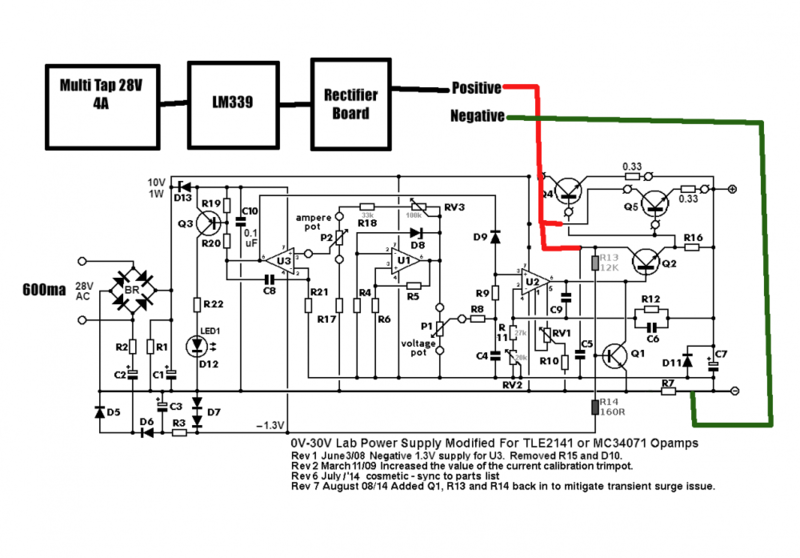 How can you use an LM339 without reading its datasheet? Since its output is "open collector" then it cannot turn on the transistor unless you add a "pullup resistor". The output of your 10A rectifier does not connect to "regulator in". Instead it has a huge filter capacitor (12000uF) and it powers the driver and output transistors of the regulator circuit. R13 should connect to the fixed +40V. When you switch taps then the huge filter capacitor must instantly charge with an enormous current that will burn out or weld the relay contacts. Sorry. I was aware of the pullup resistor. I will stop from here and stay with the standard project. I will stick with the lm311 and a lm35 for cooling the heatsink. Once again, thank you for your help and patience, audioguru. I understood your explanations and I already know what I did wrong. I know I have a specific topic for the improved project, but I'm still trying to understand some things in the original project. I can not understand the operation of transistor Q1 in the circuit. It has been said here in the forum that this transistor works as a protection system, could someone explain to me how this works? Does the power supply need no protection fuse in the output? How does it protect itself in the case of a simple polarity change, for example: a battery being connected with the polarities exchanged in the output with the whole circuit without power in its entrance? Or even if it is powered, but with the polarities of a load on its output inverted? That is, is she going to protect herself against dodgems like me? The original old Greek kit used TL081 opamps that have a problem called "Opamp Phase Inversion" where the output goes positively as high as it can if an input voltage gets within a few volts from its negative supply voltage. The improved project used newer opamps that do not have this problem. When the power supply is turned off then the huge positive filter capacitor for the rectifiers takes time to discharge but the low current negative supply capacitor discharges quickly. Then the output of this power supply project will have opamp U2 to force the output of the project to go positively as high as it can which will probably destroy whatever you were powering with it. The resistors on the base of Q1 detect that the negative supply voltage is dropping and causes it to conduct and short the output of opamp U2 to 0V so that it cannot cause the output of the power supply to go positively as high as it can. The circuit does not have a huge high current diode at its output to block a negative high current at its output from damaging it. A huge high current diode might be too slow to protect against damage. Now, finally, I have been able to understand the function of Q1 and resistors R13 and R14. I'm doing tests on a Prontoboard, and during the power-off, the output voltage goes to the maximum when the transistor Q1 is removed from the circuit. Thank you very much for your new explanations, I had not been able to understand them in the past. hi all, i have design pcb. what do you think ? Lots of people made pcb designs for this modified circuit. I did not use one and I did not look at them. Sorry, I also did not look at yours. Hi there, why don't you just build your design and then share your experience with us. For transistor Q1 I am using the TIP31C. The R 15 resistor is 100 ohms. The resistor R4 is with 1K. The zener D8 is a common type of 5.6V, as I can not find the one recommended by you. All other components are in accordance with your recommendations. Opamp U2 has a DC voltage gain of typically 200 thousand and its negative feedback connects directly to the output with R12. The negative feedback sets the actual gain at 2.68 times so if the output tries to decrease 1V then the actual output decrease will be only 13.4 micro volts which is almost nothing. Maybe your wiring (solderless breadboard?) has a voltage drop that the opamp is correcting. Transistor Q1 is simply an on-off switch that should be off when the power supply is powered and working. The TIP31 is larger than it needs to be but should work fine. your changed values of R15 and R4 are fine. Sorry, I was referring to Q2. 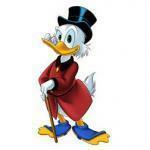 I'm using TIP31C for Q2. The TIP31 is 83 times slower than the BD139 that I recommend that has almost the same speed as the original 2N2219 that got too hot as Q2. Then the TIP31 will probably cause oscillation. The 24VAC transformer has an output voltage too low for this power supply to produce 30VDC at 3A. The regulation will fail and there will be lots of ripple in the output at and above about 25V at 3A. I recommended a 28VAC or 30VAC transformer and higher voltage opamps years ago. For an output up to 5A then the transformer max output current should be 7A or more, the main filter capacitor C1 value should be about 17000uF or more, there should be 3 output transistors each with its own emitter resistor, a larger heatsink for the output transistors and change the value of R7 from 0.47 ohms to 0.27 ohms. I finished making improvements on this project in July, 2014 but others have made more changes. Sorry, I did not see the 48VAC total voltage. The maximum allowed current from the 48V transformer is only 3.33A but for an output from the project of 3A DC, the transformer must produce 3 x 1.414= 4.2A, because the rectified 48V produces 66VDC at 3A which is 198VA. But the transformer is rated at only 48V x 3.33= 160VA. Since the voltage is almost double what is needed then the heating of the parts is about 3.5 times more than with a suitable 28V or 30V transformer.